Here at Zath, we’ve been covering the development of netbooks pretty much since they sprung onto the market in the surprisingly small shape of Asus’ Eee PC, and we’ve kept you up to date with the new releases, done a few reviews and even seen how people have confusing netbooks with notebooks. But what we haven’t done yet is given a good account of what it’s actually like to live with one — until now. We’ve already covered being a “digital nomad” in using Windows with your media, so I thought, what better way to follow up on that and give the whole netbook lifestyle of living off “the cloud” a good workout than take it on holiday to France for 2½ weeks and see how it pans out. This article will document the advantages and disadvantages of having a netbook (including a more detailed insight into the one I’m actually using), how practical it is to use in France and of course a diary on the technology related thoughts I have on my travels. There are two main things you will need to know — where I’m going and what I’m using. My fairly unoriginal route takes me down to London, across on the ferry to Calais and then past Paris all the way to south-west France near Bordeaux and then back up again (paying a visit to Futuroscope!) and home again. 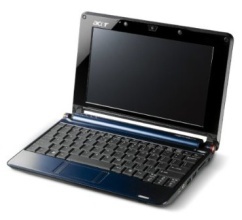 The netbook that I will be using will be the Acer Aspire One AOA-150 Ab (which is blue, with 1GB RAM, a 120GB HDD and Linux Lite Plus) which was purchased for a very reasonable £158 used from Dabs.com. But of course I couldn’t leave it like that, so I mounted XP to a memory stick and subsequently installed that, and downloaded as many drivers as physically possible. My first impressions were good — it definitely looks as nice in real life as it does in the pictures, and although the screen size can be awkward with certain websites (namely Facebook) you learn not to notice it and after a while and soon you’re ooh-ing and ahh-ing at the size of a 19” screen! The keyboard is also very impressive, although I originally had my reservations that the smaller size would result in my typing speed plummeting it, in fact, is very easy to get used to (especially if you have small fingers like me), although the larger-fingered members of our race may get very annoyed very quickly. In fact the more I used it the more I came to realise that the statistics suggesting that people use them more inside then when travelling make perfect sense — if you have WiFi in the house it’s brilliant for walking around with, talking to people on MSN Messenger, listening to music, checking on emails while watching TV or even watching TV shows on BBC iPlayer (which works very well). I think this may even be it’s speciality as it definitely beats the house laptop in convenience, portability and weight! However being good within the house is one thing, but how will it cope on the road with its measly 3 cell battery, small keys and small screen? Well I will find out soon enough — and just for an added bonus I have just broken my leg so will be relying on my netbook, three books and my very poor French to entertain me for 2½ weeks! The first thing that I noticed about using netbooks whilst on the move is how much easier they are to use than laptops — yes they are smaller and thus have smaller keys and screen, but I found it a damn sight easier to have it on my lap and to be typing away than it would be if I had a 15” laptop. The smaller scale also makes a whole host of other travel related things easier — things you wouldn’t have thought about: for a start I didn’t have to buy a ludicrously expensive bag to house my new pride and joy, it fits perfectly well into all of my usual hand-travel bags and so long as you are careful not throw it around (especially as it has an HDD rather than the flash SSD version) and use the nice sleeve that comes with it! Now a few of you may be questioning my decision to purchase the HDD version rather than the faster, more durable if less expansive flash SSD version, but it is a decision that I would definitely standby. I feel that being able just to dump all your documents, music and photos on it when you go away is a massive advantage, and being able to show people these when on the go is definitely something that I have already found backs up my choice. And yes it may make a weird noise when you occasionally ask it to retrieve a big file, and yes it does take more time (but by no means a lot) to load up Windows XP but at least you have the space as well as having an easy-to-use o/s, and without the ability to store and watch films on it whilst going down to London I would have been forced to resort to playing pinball or even worse socialising with my fellow car users! So it’s all looking pretty rosy so far, but it would be unfair to paint a picture of perfection. After about an hour (just past Bedford for those keeping track) I felt a burning sensation on my left leg, and upon investigating found that the fan from the Acer Aspire One was very hot, to the point where I considered turning it off to let it cool down. As it turns out it stays at that temperature and putting a layer between it and my leg I was fine, but it is still irritating and a little painful! The second problem that I found with my otherwise faultless Acer Aspire One (I think I need a name for it but can’t think of any suitable ones… suggestions?!?) was the battery life. I knew beforehand that the 3-cell battery wasn’t much of a marathon runner, but it still surprised me a little when it started flashing warnings at me after only 2 hours and died after 2hr 15 as we met the M25. This was annoying for two reasons — firstly many of its competitors (and even the later version of the Aspire One) have 6 cell battery’s lasting anything up to 7 hours, and it should have occurred to me to invest in a 6 cell one (rather than an illegitimate 9 cell of dubious quality). The second was that I had downloaded all of the maps for how to get to my friend’s house in south London onto my netbook, and with ill-deserved smug-ness had ignored the roadmap in my hall. Needless to say, we were a little (3 hours) late! We left off at my friend’s house where I was staying the night to catch the early ferry, and it was here that I was reminded of the interesting task of naming your wireless network — by having a quick look at the networks around this London suburb I was able to deduce the names of many of the neighbours simply by their unimaginative wireless names. But I digress! The morning dawned and we were on our way to the ferry, and although I was a little disappointed (but not overly surprised) to find there was no Wi-Fi on the ferry (one and a half hours wasted) I was generally happy as we disembarked and headed onto French soil. Firstly, Wi-Fi is actually advertised in French service stations (in the same way that that coffee cup denotes a cafe) but soon enough I realised this was a bit of a waste of space as every station did, in fact, have free Wi-Fi which you could easily and quickly use. Difference number one! Difference number two was that it wasn’t hidden away in a corner or attached to some retail brand but was just sitting there, password-free, for you to use anywhere, some even had special rooms with power plugs, special shelves and bar stools for you to use. Difference number three: people were actually using it. Admittedly I haven’t been to every service station in Britain and neither do I claim to be an expert on its usage but in my experience, it is invariably limited to an American couple talking very loudly — but in France there was always a couple of people sitting around with laptops and a few more with phones. In fact, very much like you might find in Starbucks with their free Wi-Fi. So a big thumbs up for the French service stations — but it got better when I arrived at my hotel. As you can imagine it wasn’t a top quality one (the Travel Lodge of the French world) but it still not only offered free Wi-Fi but I was able to use it in my room. They had the common sense to not only use a powerful enough router but also to place it in the centre of the building so everybody could use it in the comfort of their own room. I say comfort… the rooms weren’t brilliant and I was baking hot all night, but at least I had my netbook internet access! So far, here’s a country with Wi-Fi for the masses! 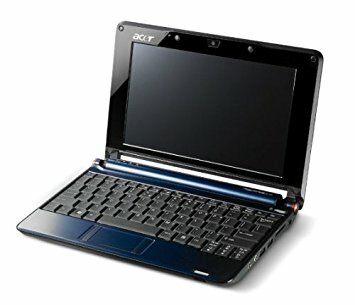 Other Travelling Digital Nomads With Netbooks? Onwards we travelled to our destination at Cap Ferret, netbook in hand (or to be more exact on lap), and soon enough we arrived and set up camp. As you can imagine exploring isn’t too easy with crutches, but fortunately, it didn’t take me too long to find what I was looking for despite the fact that we were on a campsite in the middle of nowhere — WiFi. Now this was a surprise to me, whilst you can expect hotels and the like to have WiFi you don’t normally think of laptops and ‘techies’ when it comes to camping but it would appear that Continental Europe is quite a few steps ahead of us with regards to this (I later found out that this wasn’t even a new feature, it had been present at the campsite for three years now, so clearly they must not have issues with customers and online piracy, unlike a certain pub landlord in the UK). So, satisfied I logged onto the free WiFi and sat there happily surfing around, feeling pretty smug but admittedly a little lonely — I mean who I their right mind would bring a laptop/netbook to a campsite? Well, it would appear that it was quite a few… I sat down at 9am and I was on my own, by 9.30am there was 8 (bearing in mind this campsite accommodated for around 100 people) and by 9.45am there were 15 of us sitting on benches in the sun and people were giving up as the router refused people access as bandwidth ran out. Not only was the volume of people using WiFi much higher in France (which may well be correlated to the amount of free WiFi available) but the types of machines being used was also interesting. Over the week I was staying there, I would say it was split pretty evenly between full size (15″ plus) laptops and netbooks which surprised me a little as I am used to being surrounded by businessmen and gamers with massive laptops at the WiFi hotspots in the UK. As far as netbooks were concerned by far the most popular model was the Acer Aspire One appearing in the adorable blue which I own as well as the relatively fetching red (it appears the stereotype of the stylish French extends to netbook/laptop colours as well), followed by the Asus Eee PC (with representatives from most of the screen sizes) and various other types including the new Archos 5 and MSI Wind. The two most irritating things are related to the keyboard and trackpad: whilst in nearly every other way the keyboard is absolutely faultless the placement of the delete key right next to the small backspace key meant that when erasing lines of text I was constantly pressing delete instead and erasing the wrong bit. The second thing is the trackpad — although it looks lovely with no lines (and you quickly get used to the buttons being at the side) the lack of section set aside for scrolling up and down really is missed when you are trying to look through large documents. But to be honest these are really minor qualms and they pale into insignificance when you consider the great screen, solid design and otherwise faultless keyboard as well as the relatively quick boot and ease of use; and I found that after a while I was the person getting looks of envy from other netbook users! So, I’ve spent a lovely two weeks in France sampling not only the French lifestyle but also seeing what living with a netbook (or more specifically the Acer Aspire One) is like on the road; but alas it is time to return home, say goodbye to France, and look at what we’ve learned. But just before we left I had one treat left: a trip to Futuroscope. Many of you may not have heard of it, but it is essentially a theme park (situated near Poitiers) that instead of having hair-raising rides and other kinetic based attractions, focuses on the art of ‘visual technology’. Although fairly vague that is actually a fairly good description — the park offers a combination of IMAX, 3D, Augmented Reality and dynamic cinema (basically seats that move) based attractions which are not only fun but interesting from a techies point of view; especially the neat use of water and lasers to create a childish but breathtaking evening show. The concept of a technology-based theme park continues with the inclusion of ‘cyber avenue’ which houses various retro coin-op gaming machines, internet access (although irritatingly no WiFi) and a room packed full of Xbox 360’s. Overall a great day out (and I would thoroughly recommend it to anyone) but unfortunately we must return home, but it gives us an opportunity to reflect on what we’ve discovered. Firstly we’ve found that in many ways France is more encouraging to the netbook user; something reflected not only in the number of people using them but also in the amount of free WiFi available for general use. But of course, we’ve also had the chance to put the Acer Aspire One through its paces and be able to come to a conclusion as to what it’s like to use. And that is? In my humble opinion: awesome! Yes, it is no angel and it definitely has its flaws but even they are easily forgotten or fixed: the delete key is occasionally painful (although I have started to do it less the more I use it) and it could really do with an efficient scroll section to the trackpad — and if you are struggling for battery life you could always purchase a 6-cell version like I’m going to. But there are so many positives that put it right at the top of the netbook hierarchy: the cost (half that of many others), the beautiful looks, the well designed and proportioned keyboard, the ample memory and hard drive space and pretty much faultless screen all add together to make something that leaves you unsurprised that it’s the top selling netbook in Europe. And long may it remain there, for it is one of the few gadgets that I have actually come to love!